Chinese President Xi Jinping, front left, accompanied by his wife Peng Liyuan, are received by Sheikh Mohammed bin Rashid Al Maktoum, the Vice President, Prime Minister and Ruler of Dubai, front right, and Sheikh Mohamed bin Zayed Al Nahyan, Crown Prince of Abu Dhabi and Deputy Supreme Commander of the UAE Armed Forces, second right, after their arrival in Abu Dhabi, United Arab Emirates (July 19, 2018). The UAE’s enthusiastic welcome of Xi came alongside new deals. Chinese President Xi Jinping began his first trip abroad since being unanimously re-elected in a symbolic vote by the National People’s Congress in March. His first stop was the United Arab Emirates, continuing a theme of Chinese influence in the Middle East begun at last week’s China-Arab States Cooperation Forum (CASCF) in Beijing. When Xi arrived in the UAE on July 19, it marked the first visit by Chinese head of state in almost 30 years. On July 20, he met with UAE Vice President and Prime Minister Sheikh Mohammed bin Rashid Al Maktoum and Crown Prince of Abu Dhabi and Deputy Supreme Commander of the UAE Armed Forces Sheikh Mohammed bin Zayed Al Nahyan at the presidential palace. Both UAE leaders had also greeted Xi and his wife upon their arrival in Abu Dhabi. As another sign of the UAE’s embrace of China, Xi received the Order of Zayed, the UAE’s highest civil decoration, on July 20. Previous recipients, according to UAE newspaper The National, include King Salman of Saudi Arabia and Queen Elizabeth II. Indeed, energy, a traditional focus for China’s Middle East engagement, was another key part of Xi’s visit. Deals on both oil and solar power were forged in separate MOUs. There were also agreements on agriculture, e-commerce, and finance as well as people-to-people exchanges. Sheikh Mohammed even set a goal of doubling both China-UAE trade (around $54 billion in 2017) and Chinese visitors to the UAE, which topped 1 million last year, at an unnamed point in the future. In addition to the individual deals, China and the UAE upgraded their relationship to a “comprehensive strategic partnership,” the first Middle Eastern country to elevate ties with China to that level (unless you count Egypt, which established a comprehensive strategic partnership with China in 2014). Fittingly, Xi’s letter called for China and the UAE to be “strategic partners who truly trust each other” and work together on regional and international issues. 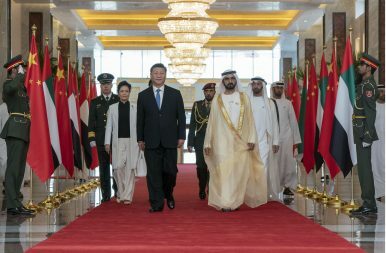 Sheikh Mohammed bin Rashid affirmed on Twitter that Chinese and UAE leaders “have a strong political will that will lead us towards greater cooperation.” He also praised China’s development model, saying, “We are similar to them in our style of management and philosophy, and they are the closest to us.” That’s a win for China’s efforts to promote itself as an alternative blueprint for developing countries to follow. However, there was an unspoken elephant in the room: Iran. As Diplomat blogger Bonnie Girard noted earlier this week, the UAE is deeply concerned about Iran posing, in Minister of State Dr. Sultan Bin Ahmad Sultan Al Jaber’s words, “a direct threat to the safety, security and stability of our region and the world.” China, which maintains close ties with both Iran and Arab nations, has so far managed this balancing act adroitly, however. Xi is scheduled to depart the UAE on July 21, after which he will head to Senegal. This trip is centered around the annual BRICS summit, which brings together the leaders of Brazil, Russia, India, China, and South Africa. With South Africa as this year’s host, the rest of Xi’s overseas tour will center on the African continent. In addition to South Africa, Xi will be visiting Senegal and Rwanda for state visits, along with a stopover in the island nation of Mauritius.